Exotic plants often generate physical and chemical changes in native plant communities where they become established. A major challenge is to understand how novel plants may affect trophic interactions in their new habitats, and how native herbivores and their natural enemies might respond to them. We compared the oviposition preference and offspring performance of the crucifer specialist, Pieris brassicae, on an exotic plant, Bunias orientalis, and on a related native plant, Sinapis arvensis. Additionally, we studied the response of the parasitoid, Cotesia glomerata to herbivore-induced plant volatiles (HIPV) and determined the volatile blend composition to elucidate which compound(s) might be involved in parasitoid attraction. On both host plants we also compared the parasitism rate of P. brassicae by C. glomerata. 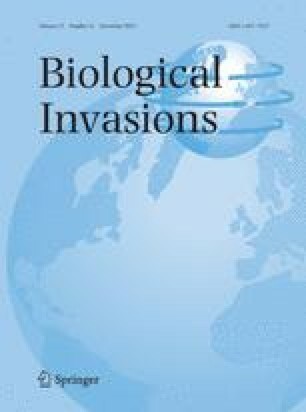 Female butterflies preferred to oviposit on the native plant and their offspring survival and performance was higher on the native plant compared to the exotic. Although, headspace analysis revealed qualitative and quantitative differences in the volatile blends of both plant species, C. glomerata did not discriminate between the HIPV blends in flight-tent bioassays. Nevertheless, parasitism rate of P. brassicae larvae was higher on the native plant under semi-field conditions. Overall, P. brassicae oviposition preference may be more influenced by bottom-up effects of the host plant on larval performance than by top-down pressure exerted by its parasitoid. The potential for dietary breadth expansion of P. brassicae to include the exotic B. orientalis and the role of top-down processes played by parasitoids in shaping herbivore host shifts are further discussed. The online version of this article (doi: 10.1007/s10530-013-0459-2) contains supplementary material, which is available to authorized users. We thank Roel Wagenaar for rearing the parasitoid wasps; Leo Westerd for supplying butterfly eggs; Gregor Disveld for the technical assistance in the greenhouse; Olga Kostenko and Koen Verhoeven for the fruitful discussions on the statistical analyses; Keith Clay, Antoine Branca, and two anonymous reviewers for very valuable suggestions; This work was funded by a PhD-fellowship from the Portuguese governmental institution, Fundação para a Ciência e Tecnologia, to T. M. Fortuna (SFRH/BD/40531/2007).